16m long x 8m wide x 6m deep. 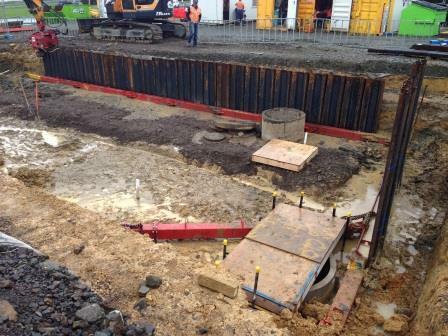 Temporary works design supplied by TSNZ complete with calculations and installation sequence drawings. The first MGF frame is assembled then used as a guide for the trench sheets. 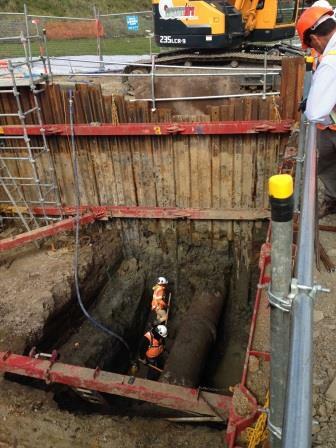 A second frame is placed, excavation proceeds and the frames are lowered to pre-designed positions before being pumped out to the required pressure. Frames are hung from chains attached to the sheets.